Pictured L-R John O?Keeffe, VP EMEA, Nitro, Enda Quain, Head of Technology Integration and Assurance, AIB and Sam Chandler CEO and Founder, Nitro. 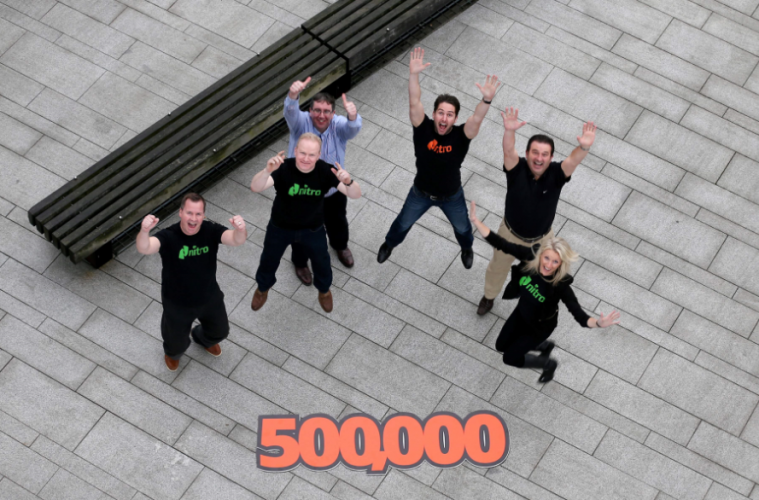 Nitro, a leading provider of document productivity and workflow solutions, announced reaching 500,000 customers globally as one of Ireland’s largest commercial and retail banks, Allied Irish Bank (AIB), has signed on to rollout Nitro to over 1,000 employees. Nitro has experienced over 50% growth in Europe since announcing the opening of its Dublin office at the 2013 Web Summit. Australian-founded with global headquarters in San Francisco, Nitro simplifies the way people create, edit, sign, and share digital documents. Best known for its award-winning Adobe® Acrobat® replacement, Nitro Pro, the company recently unveiled Nitro Cloud, providing flexibility to businesses when sharing, signing, and collaborating with documents. Nitro officially established its EMEA headquarters in Dublin in January of last year with plans to hire 50 employees in its first two years of operation. Since then, growth expectations have doubled with plans to expand to over 100 staff by the end of 2016. Plans are also now underway to open an EMEA data centre in Ireland by the end of 2015. The growth in EMEA has been faster than in any other region in which Nitro operates over the past 12 months. Australian-founded, Nitro is headquartered in downtown San Francisco with offices in Melbourne, Australia; Dublin, Ireland; Nitra, Slovakia; St. Petersburg, Russia. One of the fastest-growing private companies in the world, Nitro is also a multiple Inc. 500/5000, BRW Fast 100, Deloitte Technology Fast 50 and Software 500 award winner. More info: www.gonitro.com.